The VCG is a place for interaction, inspiration, and learning, and the centerpiece of Varsity’s gardening-based community programs. The VCG hosts a variety of occasional garden-related events, including workshops, open houses, and socials. Raised Beds: These 36 plots (two per raised bed) were the first structures built by the founding garden members in 2013. Most of the raised beds are rented out to individuals or families. A few are group plots tended by volunteers and enjoyed by all members. One plot is assigned to children attending the VCA Out-of-School participants. In-Ground Beds: The eight in-ground beds were the next to be built by volunteers in 2014. Each plot has the same 4’ X 8’ (32 sq. ft.) of planting space as the raised beds, only closer to the ground. Wicking Bed: One of the 4’ x 16’ ft. raised beds were designed for mobility-challenged gardeners. 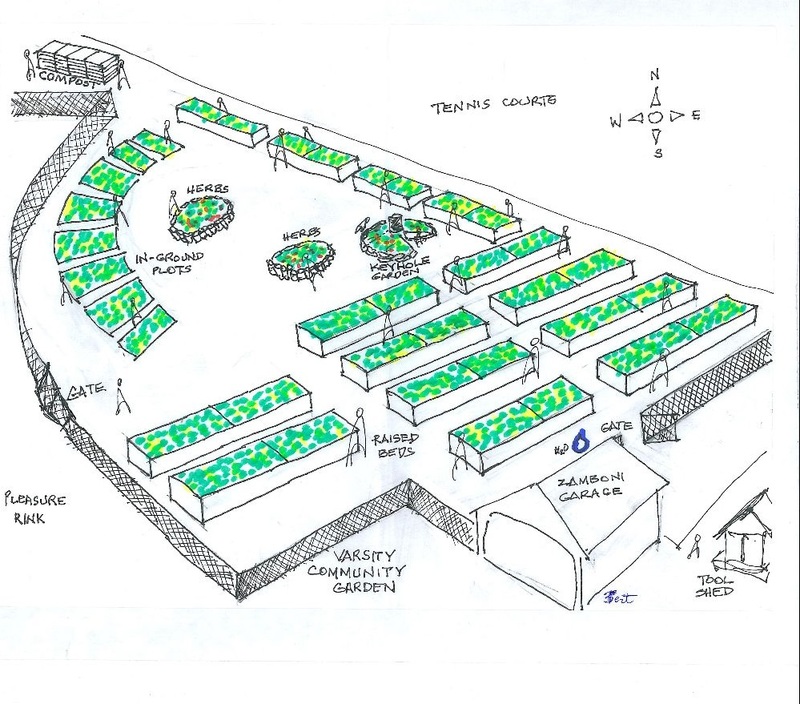 It is divided into two 4’ x 8’ plots that share a common bottom-up irrigation system. Children’s Keyhole Garden: The keyhole garden is a circular plot for kids. It was designed with higher planting surface in the middle that slopes down to the perimeter. It also has a compost basket at the center accessible from the keyhole. Compost System: There are four wooden bins arranged in a row. Together they were designed for gardeners of all ages to make compost from organic materials such as garden and kitchen wastes supplied by the gardeners themselves. Seating Area: At the center of the community garden is a seating area under a fabric canopy (called a Coolaroo) that provides shade to gardeners and visitors. Small workshops and meetings can be held in this shady area surrounded by vegetables, herbs, and flowers. Potato Patch and Free Garden: One long and narrow in-ground plot is known as the Potato Patch and Free Garden. Surplus seeds and seedlings donated by members have planted and nurtured by volunteers during the planting season. Tool and Storage Shed: The Varsity Community Garden Club keeps its shared tools such as hoses, wheelbarrow, hand tools, watering pails, and other gear in this secure 8’ x 12’ shed.